NEXTBIGFUTURE – April 3, 2018: An optimal shielding configuration has been realized during a phase I NASA NIAC study, and it is referred to as a Magnetospheric Dipolar Torus (MDT).A This configuration has the singular ability to deflect the vast majority of the GCR including HZE ions. 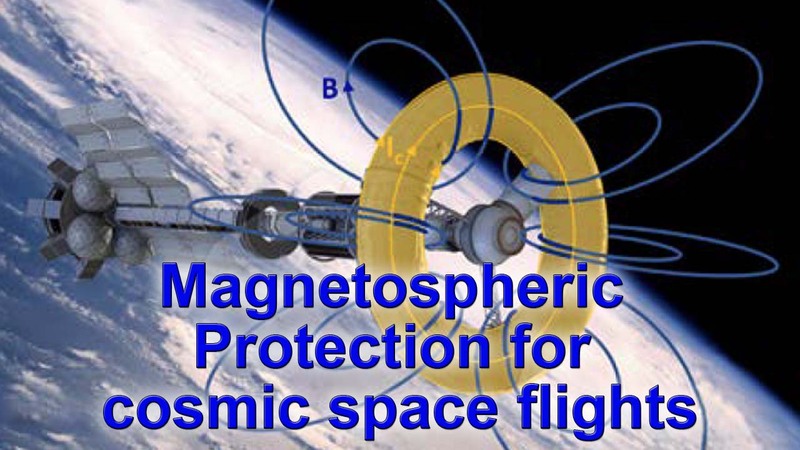 In addition, the MDT shields both habitat and magnets eliminating the secondary particle irradiation hazard, which can dominate over the primary GCR for the closed magnetic topologies that have been investigated in the past. MDT shielding also reduces structural, mass and power requirements. During the phase I study the particle code to evaluate magnetic shielding of GCR evaluated a wide range of magnetic topologies and shielding approaches from nested tori to large, plasma-based magnetospheric configurations. It was found that by far the best shielding performance was obtained for the MDT configuration. TASS / BATTLE FOR WORLD – October 26, 2018: The article highlights that Russian scientists want to protect cosmonauts from the solar wind in inter-planetary flights with the help of magnets, according to a program of joint work of the Reshetnev Information Satellite Systems and the Siberian branch of the Russian Academy of Sciences obtained by TASS on Friday (October 26). “A magnetic dipole [the system of two magnetic charges] is the sole method of protection that can be implemented in the foreseeable future,” the document says. The interaction of such a magnet with a solar wind flow will create a mini-magnetosphere, it notes.